Entry-level road shoes: with or without ratchet buckle. I wear recessed-cleat SPD cycling shoes for at least 90% of my rides, but when I wear rigid road shoes, I really feel the difference. Only their inherent clumsiness when you’re not clipped in and spinning, combined with poor longevity, prevents me from wearing them for everything. 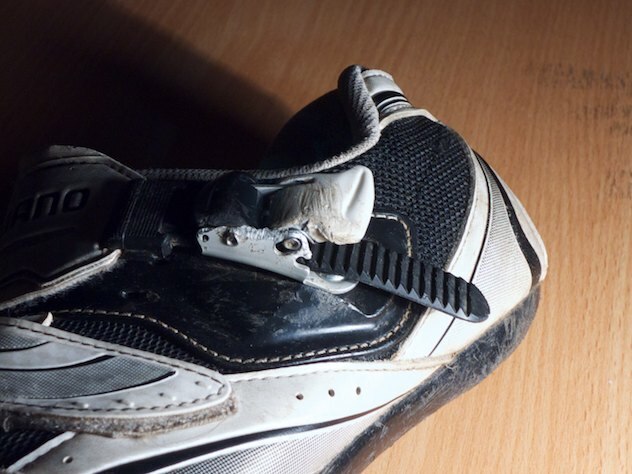 Shimano’s entry-level R078 / R088 shoes are very similar, the principal difference being the top strap, which is velcro on the R078 and has a micro-ratchet mechanism on the R088. The cheaper shoe is more reliable but you’ll get a consistent fit, and easier adjustment, from the more expensive model… so long as you don’t break a ratchet! At the time of writing, Chain Reaction are doing a very nice 33% discount on the R078, and a 33% discount on the R088 too. Wiggle have the R078 at 26% off and the R088 at 20% off. Both three hole (SPD-SL, Look) and two hole (regular SPD) cleats are supported. 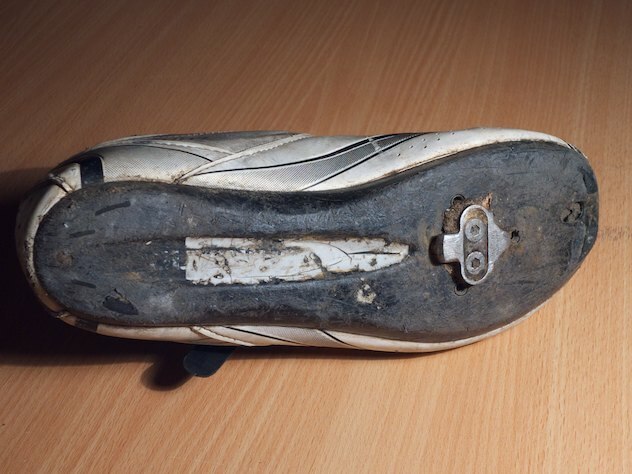 This is great if you want a stiff shoe but are happy with the performance of regular double-sided SPD pedals – in particular, you’ll get huge mileage out of metal SPD cleats on these exposed soles where the plastic road ones will break every so often. If your riding involves a bit of hopping on and off the bike (mixed mode commutes, or long audax / sportives) then you should definitely bear this in mind. Pushing hard onto the small SPD cleats doesn’t feel any different to me. The light coloured material along the middle of the shoe is after-market reflective tape, so I look even more bizarre while riding laid-back at night. Shimano shoes are built on a narrower last, particularly in comparison with US manufacturers, so be careful of sizing if you’re coming from Specialised or similar. Happily, you can buy the R088 in a special wide fit if you have that need – but don’t go crazy. I’ve got “normal” UK feet and wear normal shoes (but my better half would want the wide ones). Check the size charts! The Shimano R078 / R088 are made of synthetic leather, which means they’re durable and don’t need much in the way of care and attention. That said, if you go for the white option, be aware they they’ll soon become grey unless you’re quite exacting with the cleaning regime! 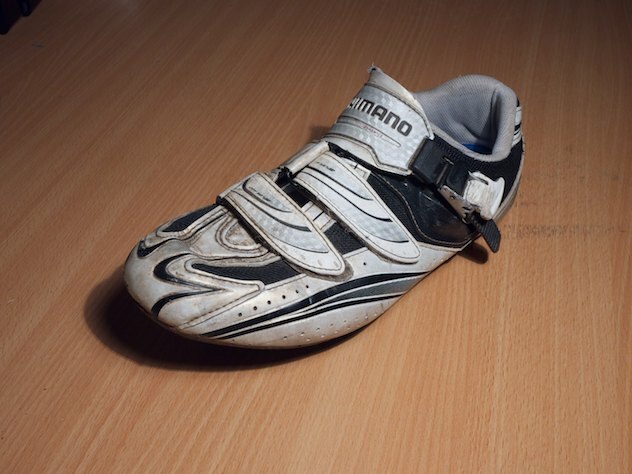 The soles are fibreglass, and designed to be quite stiff but not absolutely rigid (either carbon or fibreglass could be made completely rigid – the graduation between glass and carbon shoes in the cycling market is party a question of weight and partly to provide an up-sell path). While flexible shoes are tiring on your feet, it’s not clear to me that there’s a meaningful increase in efficiency going from rigid to super-rigid and hyper-rigid outsoles. Once your feet aren’t a limiting factor and you’re comfortable, you should be set for top performance, physiologically. Mine weigh in at around 580g for the pair. This is one area where spending an extra £100-200 could get you some savings, with absolutely minimal road shoes going as low as 300g. 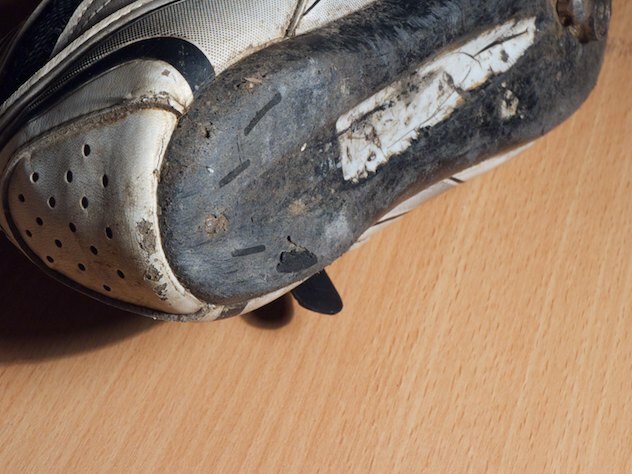 The sole has rubber at each end to make it slightly easier to walk off the bike, or put your toes down at junctions. This works pretty well until it wears away (after a year or two you’ll probably be thinking of sticking some glue on to boost the effect). There’s a reasonable cross-section of mesh on the uppers of the Shimano R078 / R088, and there’s also a cut-out in the centre of the sole just behind your toes, which is echoed in the manufacturer-supplied insole. While I don’t normally notice it, a similar hole in the insole of the shoes I wore during the 1200km of Paris-Brest-Paris became pretty frustrating and I duct-taped over it to try and soothe my irritated feet (with variable success). On the whole I find these a pretty good performer in hot weather. Even though it’s rarely hot in the UK, it’s more important to have a shoe that’s cool since you can easily add an overshoe, thicker socks, or both as required. Both models of shoe are solid entry-level performers from Shimano. They’re pretty light compared with a conventional SPD shoe, and very noticeably stiffer, cooler, and nicer to put down the power with. The ratchet tightening system on the SH-R088 adds £10 to the asking price, and having broken one of my ratchets (above) I do think they represent a weak point on the shoe, although they help get a tight, consistent fit. 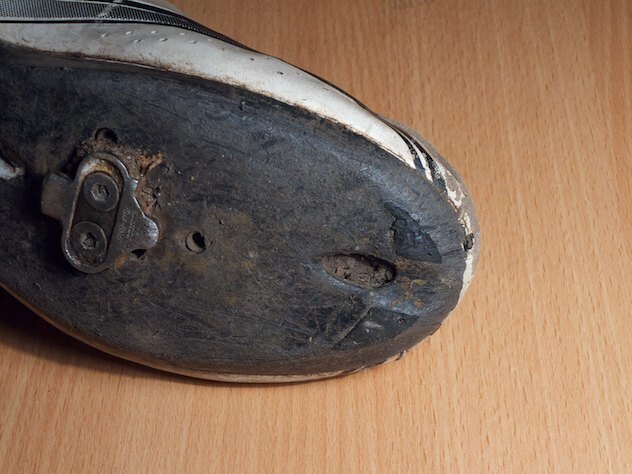 The ability to use both three-hole and two-hole cleat systems is great if you’re looking for a rigid shoe to combine with conventional SPD pedals and only a bit of walking about – this is how I currently have them set up, after a couple of dissatisfactory episodes with Look Keos. You do need to be a little careful of the sizing, but probably no moreso than any other time you buy shoes – at least you can send them back for free if you buy from Wiggle / CRC! Again, at the time of writing, Chain Reaction are doing a very nice 33% discount on the R078, and a 33% discount on the R088 too. Hey, thanks for the review. I see you are using them without the cleat adapter (SM-SH40). Did you experience any problems without it? They seem to work just fine with this configuration, I’m just a bit concerned about breaking them off or damaging the floor, as they are very exposed. Thanks for a great review and have now purchased the R088 to use with SPDs. I wondered do you just fit the 2hole cleat directly on to the sole of the shoe, or do you have to remove the panel and recess the cleat? I hope this makes sense! It just goes directly onto the sole (as with a three hole road cleat).